Two prominent members of the Transparency International Sri Lanka its chairman and senior lawyer J. C. Weliamuna and leading investigator B.A.W. 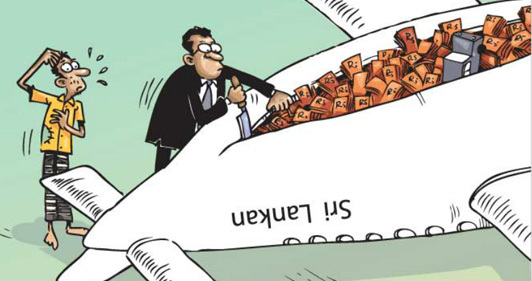 Abeywardane were part of the Board of Inquiry which found shocking details of corruption running into billions of dollars at Sri Lankan airlines under the former government. The Board of Inquiry headed by J. C. Weliamuna found instances of gross abuse of power,manipulations of service contracting, recruitment of unqualified staff and major security breaches. The Weliamuna report recommends criminal investigations into the most of the allegations they have made through the report. A Board of Inquiry has found shocking details of corruption running into billions of dollars, manipulations of service contracting, recruitment of unqualified staff and major security breaches at Sri Lankan airlines under the former government, the Prime Minister Office said today. Issuing a statement the PM office also stated: The panel headed by anti-corruption advocate and senior lawyer J. C. Weliamuna found instances of gross abuse of power by former chairman Nishantha Wickramasinghe whose penchant for young air hostesses cost the debt-ridden airline even more problems. The former government of President Mahinda Rajapaksa made management changes to carry out a re-fleeting of the airline with brand-new aircraft costing $2.3 billion despite the availability of more cost effective alternatives. The Weliamuna report recommends criminal investigations into the entire re-fleeting process and have noted instances where former chairmen Wickramasinghe, a brother-in-law of Mahinda Rajapaksa, should be prosecuted. The purchase of vehicles pales into insignificance when compared to irregularities in the re-fleeting exercise and a fiasco involving the launch of an air taxi service which was eventually abandoned causing millions of dollars in losses to Sri Lankan airlines. The management of Sri Lankan staff knowingly ignored conflict of interest in companies and individuals hired to advise the national carrier on procurements leading to a reasonable assumption that they were all corrupt deals. A Cabin crew member had been released from the airline to work at the Presidential Secretariat following a request from the then Presidential Secretary Lalith Weeratunga, but she was actually released for Namal Rajapaksa‘s political work. She had been paid by the airline, including allowances for cabin work although there is no explanation of what services she provided except that she had been over paid more than 4.2 million rupees. The BOI recommends that the Sri Lankan airlines take action to recover the overpaid amounts from the staff member who has been identified in the report and direct prosecutions of those who authorized misappropriation of public finance. The BOI also found that several applicants who repeatedly failed entrance tests were eventually recruited on verbal requests from the management. The former chairman had also created a post of “SLA Brand Ambassador” and appointed his known companion, an airhostess even though no such designation was known to the national carrier. The couple had travelled abroad on tickets bought by Sri Lankan from other airlines too. “In our investigation, we can conclusively hold that former Chairman’s association with cabin crew members exposed Sri Lankan Airlines to abuse of power, causing reputational risks as well as financial losses. “BOI can also hold that there was no corporate culture in the board or the top management to raise such issues when a senior officer or the chairman was involved in such behavioral issues adversely affecting the company” the report said. The BOI has found CEO Chandrasena unsuitable for the job and was surprised to discover that he was paid a minimum monthly salary of 1.5 million rupees on top of other perks and he had also enjoyed salaries simultaneously from his other appointments. There had been a time when he drew a salary as Mobitel CEO as well as Mihin Lanka CEO. The BOI recommends criminal prosecutions of Chandrasena as well as Wickramasinghe, among other senior management staff. The BOI also found that a London station manager who tried to stop the illegal practice of sending motor spare parts for the use of former president’s son Yoshitha had been suddenly transferred out on the direction of the former President Rajapaska. The airline had also tried to hush up two serious flying mishaps involving the chief pilot Druvi Perera and Captain U. A. V. Pathirana. Two staff members involved in alleged human smuggling had got off lightly raising serious concerns whether few employees continue to support a criminal human smuggling ring. The BOI also raised questions about the suitability of appointing a retired army major general, P. Chandrawansa, who did not have aviation security experience on a salary of 450,000 rupees, without following recruitment procedure and accused him of engaging in political activities while in the employment of Sri Lankan airlines. The BOI recommends the termination of services, or immediate disciplinary action for breaching company rules. Security Department was among the most politicized. The BOI praised two senior pilots — Patrick Fernando and Ranga Amadoru — who had resigned in protest against attempts to lower pass marks of recruit pilots. “Their resignation effectively prevented the selection of unsuitable candidates in the 2013 Cadet Pilot intake. In view of their bold stand taken to protect professional standards, BOI recommends that they be commended.” the report said. The report also lists major fraud in the award of tenders and singles out a duty free deal and the sale of wine as one of the blatantly corrupt deals of Sri Lankan requiring a criminal investigation. BOI points out the corrupt manner in which General Sales Agents were appointed in many countries on behalf of the airlines and manipulations made. BOI also recommends criminal investigations on the involvement of Udayanga Weeratunga former Ambassador to Russia and Dilan Ariyawansa in several GSA appointments. Finally the BOI has concluded that the management culture was a major contributory factor for abuse of power and external interference into the business of Sri Lankan airlines.